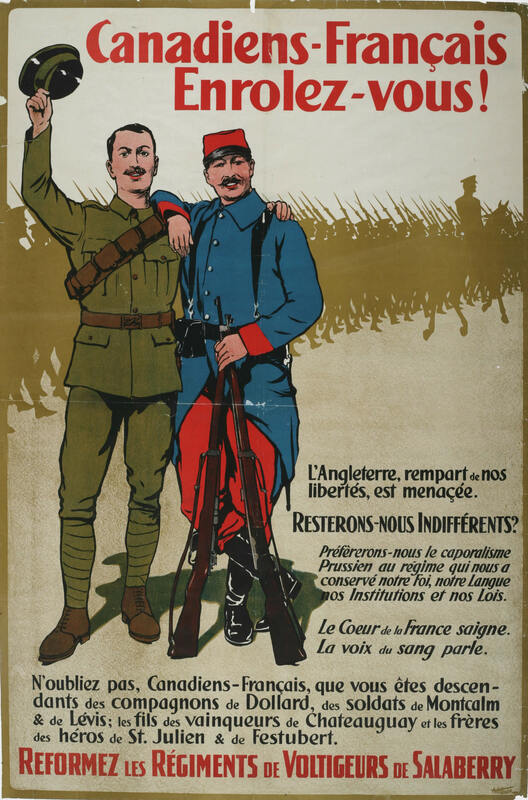 This recruitment poster for the 163rd Battalion depicts a Canadian infantry soldier standing shoulder to shoulder with a French soldier. This image, made an appeal to French-Canadians' illustrious military history with specific references to famous soldiers, including the Marquis de Montcalm, who had died in 1759 attempting to defend Quebec against British attack. It also highlights the links that existed between Canada and France, and asks French-speaking Quebecers, in an oblique reference to the Quebec Act passed in 1774, if they would prefer Prussian (German) institutions to their own. The unit is named after Charles-Michel d'Irumberry de Salaberry, who raised and commanded a French militia unit during the War of 1812, and successfully defeated a stronger American force at the Battle of Chateauguay in 1813.